To step into the studio of artist Luca Battini is to step back in time. It is a history lesson in how the great Renaissance painters created their masterpieces. Mr Battini's front room looks more like a theatre set. There are models and costumes, sketches and scaffoldings and an extraordinary array of dyes, resins, varnishes and glues. One of the models on his table is an action man fitted with real pigeon wings - it is the model he uses to paint his angels. 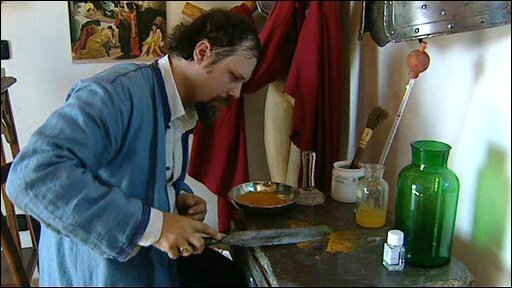 Luca paints as they did 700 years ago - he mixes his colours in the same way, laboriously grinding his powder on a large block of slate, he makes his own canvasses from linen and glue. Now, the 37-year-old master is to combine all these ancient skills to take on the most ambitious project he has ever attempted - perhaps the most ambitious work of art Italy has seen in some time. He is about to start a 1,700 sq ft Renaissance style fresco that will tell the story of Ranierus, Pisa's patron saint. 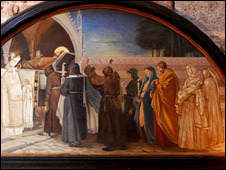 When it is finished the fresco will span eight enormous scenes across the entire wall of the Church of San Vito, in the city centre, where the patron saint is said to have died in the 12th Century. In the best Renaissance tradition, the characters of this painting will be people who live in the city. Over the past year, Luca has chosen over 100 prominent Pisans to represent the leading figures in his fresco. There have been public castings and auditions to find the other 150 characters. Among those to be included are Monsignor Alessandro Plotti, Pisa's archbishop, the Olympic fencing champions Salvatore Sanzo and Simone Vanni and the Grand Master of the Order of the Knights of Malta, Brother Matthew Festing - an Englishman. "It's an enormous project," said Luca. "And, yes, I do feel the weight of the great masters on my shoulders." "Painters like Giotto and Michelangelo have painted the history of Italy the story of the Renaissance. I am small by comparison," he said. "But I hope I can paint for Pisa something they will cherish and remember and, who knows? In the future, they might even be talking about my work." For the past year the people Luca has chosen have been sitting for preparatory drawings. 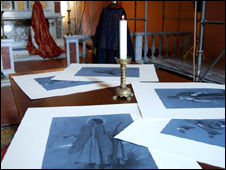 His subjects are are wearing period costumes used in two Franco Zeffirelli films, loaned by the costume archive Fondazione Cerratelli, headed by the director. They were used in the film Romeo and Juliet (1968) and Brother Son, Sister Moon (1972). At the moment he is creating and constantly changing each of the eight scenes. In his studio he has laid out the canvas drawings of each character, together with the overall plan, which show where each of them will fit and how they all interact. In the next few months he will complete the second stage of the study, in which the original drawings will be altered and re-sketched with less detail. 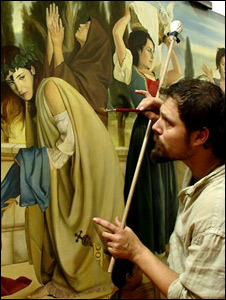 Luca will be painting so-called true fresco. The paints he makes, mixed with water, will be applied to a thin layer of wet, fresh, lime mortar or plaster. The pigments are absorbed as the plaster dries. The image of the characters will show through while the plaster is wet. But it is pressurised work once the plaster is applied. In these warmer climates, Luca will probably have just an hour to paint each small section of the wall before the plaster begins to set. "It is much more difficult painting this way," said Luca. "Because, unlike the canvas, the wall constantly changes. "As the plaster dries the colours take on different shades. The painting must begin immediately after the plaster is applied, the painting must be exact and I must work fast." Not that this will be a project finished any time soon. So vast is the area he will paint, it will take him three years to complete. For centuries the great masters have been inserting rich and famous patrons into their frescoes. Perhaps the best known examples are the frescoes that adorn the Magi Chapel in Florence, painted by Benozzo Gozzoli. Known as The Procession of the Magi, the frescoes feature various members of the Medici family, who ruled Florence, including young Lorenzo "the Magnificent" who leads the procession on his white horse. Not surprisingly competition to be in Luca's fresco is particularly fierce - some have returned several times despite being rejected, while others have complained when told which part they are likely to play. "I have told some people to go away three or four times,'' said the artist. "I've tried various ways to tell them why they have not been chosen. "I am looking for certain types of character. In the casting sessions every face is studied carefully before the final selection is made." Which is why Luca was forced to advertise repeatedly for someone to model the figure of the saint. Eventually he settled on Roberto Farnesi, a Pisan actor who appeared in a series of pasta advertisements. One of the lowlier figures to be chosen - though no less important - is Roberto Balestri, a proud Pisan, who runs a local health food shop. "I have a medieval face," beamed Mr Balestri. "It's a medieval nose. Perhaps it was also my stature," he mused. "I will be painted in as part of the crowd that looks on as St Ranierus performs one of his miracles. "To be honest I don't really care where I am in the painting. The fresco will be there for centuries to come - and my face will be on that wall long after I have gone." Luca's fresco is intended to be a twin for the enormous 14th Century frescoes of Ranierus that once adorned the walls of the monumental cemetery, the Camposanto, until they were destroyed in a fire during World War II. The celebrated British artist David Tindle, who lives outside Pisa, said he is hugely impressed by Luca's enthusiasm for the project - and his bravery. "With fresco painting like this there can be no mistakes," he said. "You put on your square of plaster, you take a deep breath and you do it. "And it doesn't matter if you are Michelangelo or the badly paid assistant - you just do it and you do it as quickly as you can. "If you make a mistake, the only way to change it is to take an axe and pull it off the wall. This sort of painting sorts the men from the boys. "But I take my hat off to him. It's wonderful that a young painter has the drive to do it - and is prepared to take the risk. "You have to have a lot of courage to take on a fresco of this size - oh, and a tremendous amount of skill."